Where to begin with such a book. It is clearly and definitely the best book ever done on Krazy Kat, which is, at least in our estimation, the greatest of the classic newspaper comics. Ergo, it is, Copacetically speaking, one of the single best volumes of comics ever produced. 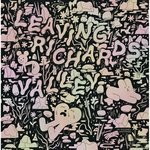 In other words, it wins the Desert Island Award™: If there were one comics related book to take to a deserted island, this might very well be it. And as if that weren’t enough, it has now been reissued in an economy softcover edition that’ll only set you back a double sawbuck. Think of it-- a lifetime of pleasure and consolation for what it would cost you to spend a few hours in a bar. And they say there is no God. For sheer aesthetic achievement, narrative inventiveness, psychological incisiveness, cultural significance, and creative ebullience, Krazy Kat, the masterpiece in comics that George Herriman produced on a daily basis from 1913 through 1944, cannot be beat. This volume provides a judiciously selected, finely reproduced and intelligently arranged collection of George Herriman’s work accompanied by an engrossing account of his life and career. By way of introduction, the authors made the amazingly apt decision to start things off by reprinting Gilbert Seldes’s one-of-a-kind essay, “The Krazy Kat That Walks by Himself,” that appeared originally as one of the chapters of his volume, The Seven Lively Arts, published in 1924 . A brief biography of Herriman’s formative years provides the reader with some potential insights into his character and its bearing on his subsequent creations before getting to the main act. The dawning of a new century coincided almost exactly with the birth of a new mass-market medium for the communication of artistic expression and the beginning of George Herriman’s artistic career working within that medium, which, for lack of a better name, has come to be known as comics. Beginning with Herriman’s early years as a journeyman illustrator who hopped a freight to the Big Apple in hopes of making it as a cartoonist (which he succeeded at almost immediately, but not before a short stretch as a Coney Island sign painter and side show barker), then detailing his involvement in the early development of the comic strip that followed fast and furious on the heels of the introduction of Richard Outcault’s The Yellow Kid, the authors present an engaging account of the early days of the comic strip as seen through Herriman’s experiences. Illustrations, political cartoons and comics strips all served the paramount function of catching the public’s eye and thereby boosting the circulation of the newspaper in which they appeared. Herriman proved himself adept at all three and early on caught the attention of what was perhaps the most important eyes of all, those of William Randolph Hearst, the powerful newspaper magnate upon whom Orson Welles based the title character of his landmark film, Citizen Kane. While Herriman was to leave and/or be lured away from Hearst papers on numerous occasions during the first decade of his career, he eventually settled with the newspaper syndicate controlled by Hearst, whose patronage was to ultimately prove crucial to Krazy’s longevity. 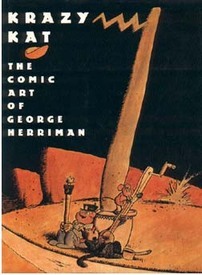 Herriman produced many different comic strips during the decade that preceded his creation of Krazy Kat. They're all discussed here and are accompanied by reproductions of representative examples. In fact, Krazy and Ignatz first appeared in one of these strips. Running along the empty white space at the foreground of the July 26, 1910 installment of "The Dingbat Family"-- which the authors of this esteemed volume have unearthed and presented for our erudition-- in what may have been simply a half-conscious doodle to fill up the space while killing time at his desk in the Hearst offices, Herriman drew the historical first beaning of Kat by Mouse. The rest, as they say, is history, and this book does an admirable job of reporting it. The bulk of the book is, blissfully, filled with high quality reproductions of the strips themselves. Most of the daily strips -- which are only a small minority, the bulk being, for obvious reasons, the Sunday Pages -- are reproduced from what is in almost all cases the best remaining source, the syndicate proofs. Of the wonderful Sunday pages, the authors managed to assemble quite a few originals to reproduce, primarily of those that originally appeared in black & white, which is how the strip ran in newspapers from 1916 through 1933. The strips that ran after 1933 and which originally appeared in color are here reproduced from mint condition copies of the actual newspapers in which they originally ran. A selection of photographs of Herriman, his family and his friends round out this eminent volume which provides the gentle reader with a joyful bounty of what is still comics’ greatest creation. PLEASE NOTE: NOW OUT OF PRINT. We are now selling best available copies. These copies may have dings and/or scuffs but will be clean, unmarked, unstained copies with NO tears or loose pages or any other major flaw.